I do not want to pessimist but it may take a while for the Hungarian basin genetic landscape to be fully addressed. I mean we are still waiting for that bloody South Asia paper! By the way any news about the South Asia paper? Is it coming or we will have to wait for another year? By the way any news about the South Asia paper? Is it coming or we will have to wait for another year? I don't know, but I'm guessing that it's being held back by some, maybe most, of the Indians involved. Maybe they're very unhappy about the ancient DNA results from India, and want to see more data, preferably from an Indian lab, that somehow contradicts the current data supporting a large scale migration of steppe peoples into South Asia, and throws up some hope for the Out of India Theory (OIT)? If so, this process could take months, if not longer. There's no way to determine how big of a Srubnaya influence the Hungarian conquerers have because we only have a handful of Srubnaya mitogenomes. Just scrolling through I saw several mHGs unique to the general region Hungary is in indicating some local east European ancestry. mtDNA can be tricky. It isn't as straightforward as Y DNA. ANyways, great study. Lots of new data, suprisingly high amount of Asian mtDNA, and interesting analysis. Impressive, serious approach to mtDNA that doesn't happen a lot. Btw guys, my new mtDNA blog is up. mtDNAwiki. Lots of brand new stuff you guys have never seen. Everything on my blog goes back to my theory on mtDNA which I describe in the "My Methods" page. Also, if you've taken an mtDNA test it is in your interest to order an mtDNAwiki Report. It'll be 1-3 pages long, has some cool pictures. It'll tell you everything known about your mHG. David, did they have genome wide data or not? David, also, about the South Asia paper, shouldn't it come out in a few weeks? How can the Indian scientists hold back Harvard? The preprint is open access, so you can check what type of data it's based on. But I did mention it in the blog post already. And I don't know what's happening with the South Asian paper. But considering that Harvard sourced a lot of samples from India for this paper, then they might be restricted in how to use these samples by the Indians, and so I can imagine that if things go sour, then the paper will look pretty poor without this Indian data. It's Hindu Nationalism. The ones responsible are doing all they can to find any not already debunked evidence against the Aryan Invasion of India and delay any papers until they can. Hinduvtas refuse to acknowledge India had any links to the outside world that had them receiving anything that played a significant role in the formations of both Harappan and Vedic India. Both materially and genomically. Especially not with the Europeans they are taught to blame all their problems on. It's no better in Egypt and how authorities there restrict access to mummies. One suspects proper testing with modern technology would surely call to question just how much continuity modern Egypyt has with the pyramid builders. As well as casting doubt on the Indigenous Birth Model of Egypt's founding. How can scientists be so radical and turn a blind eye to facts! If the South Asia paper does not appear for issues such as the Out Of India model in 2018, then i don't know what to say. It's annoying though that they teased us by announcing such a paper and now they behave like they suffer from amnesia. @Davidski Thanks mate, just what I suspected. @Salden Good points, though, Europeans had practically zero influence, both genetic and cultural, on pre-Ptolemaic Egypt. At least the Steppe populations did not. Ancient Egyptians were basically Natufians with some ANF and CHG/Iran Neolitic admixture. They were not at all Europeans, not in the least bit. But yeah, modern Egyptians are much more mixed than the ancient ones, though, the Copts are around 90 to 95% similar to their ancestors. I would say that modern Muslim/Arab Egyptians derive around 60 to 70% of their ancestry from ancient Egyptians, but no more. It's Hindu Nationalism. The ones responsible are doing all they can to find any not already debunked evidence against the Aryan Invasion of India and delay any papers until they can. Interesting. The Huns were not Uralics that's not news. So if the Huns didn't bring the Hungarian language, who did then? Haplogroup N is very rare in Hungary according to the studies listed in Wikipedia. Why did proto-Hungarians leave such a low Y-DNA influence on Hungarian populations while affecting a language shift? There are some very confused Indian scientists out there who are probably even more confused and more than a little rattled now after seeing the ancient data from South Asia, and the only thing they can do is hope that more ancient data can reverse the results, so they're probably asking for more samples and being difficult, hence the delay. Of course, nothing will reverse the results, so this process might take a while. @Nirjhar Let's just accept that there are a good number of Indian scientists who don't get the science/tradition distinction. It's not racist to say that. I myself am Indian but I definitely see this trend in India. There are scientists from other parts of the world too that share this problem, but they are a minority. As I said ,contact people who are involved , if you actually know first, who is doing what of course ! hahaha . Let's just accept that there are a good number of Indian scientists who don't get the science/tradition distinction. I myself am Indian but I definitely see this trend in India. I think you have very narrow vision, with no practical experience whatsoever. This thread is about the medieval mtDNA from Hungary, let us try to keep the discussion restricted to that. Merely because something is tradition it does not automatically become unscientific or false. Colonial and Marxist scholars dismissed a lot of what was handed down to Indians through tradition. They did not do so through scientific means but purely because of bias and prejudice. To give you an example, the British dismissed a lot of history written in Indian records because they were claimed to be of very great antiquity, an antiquity that was clearly at odds with their beliefs of earth being created in 4004 BC. Do you call that scientific ? Therefore, there is good reason to look at tradition with a fresh perspective rather than the jaundiced colonial narratives of India. Doing so does not make one unscienific. @Jaydeep That was so long ago in the 19th century colonial climate with its prevailing racist discourse. But there is no reason to dismiss modern science in the form of ancient genetics because of that alone. Do you know of scientists, researchers involved in the upcoming paper (besides Niraj Rai & Vasant Shinde) ? I have mailed the two of them but they did not reply. Maybe the western researchers would be more forthcoming. You have any clues as to when the paper maybe out and in which journal ? @Jaydeep I am of the opinion that merely accepting that certain elements in Indian tradition may have had an external origin does nothing to diminish that tradition. The same goes for any other region of the world too. Do you know of scientists, researchers involved in the upcoming paper (besides Niraj Rai & Vasant Shinde)? I have mailed the two of them but they did not reply. Maybe the western researchers would be more forthcoming. Nick Patterson is involved. He asked you to e-mail him once. Maybe you should now take him up on that offer? Feel free to let us know what he says. I made a general remark about why having a fresh look at tradition unconstrained by earlier prejudices is not being unscientific. You should be aware that there are lot of assumptions about India including its history which are based on outlandish theories made in the racist atmosphere of the late 18th & the 19th centuries. Though the western scholars and researchers denounce the racism of the scholars of that era, they will still continue with the theories which were a product of that racism. The fact is this - if we Indians are not going to stand up for the correct interpretation of our history and tradition, no one else will. Muzhe aap apna mail mere blog mein post kar dein , main contact karunga samay ke anushar :) . But there is no reason to dismiss modern science in the form of ancient genetics because of that alone. And you know they are ''dismissing modern science ''from the basis of Eurogenes and personal intelligence I would say?. Why not first you my friend ''feel free to let us know'' what he said to you?? . Nothing much. My speculations about the paper in this thread are just that. I am sorry but my English is weak , can you please clarify a bit ?. @Jaydeep I am all for the correct interpretation of Indian prehistory and history man. But there are genuine concerns whether the genetic data available to us will not be put to good use because of political reasons. Other than that, let's wait for what the studies would show. Let's wait for Jaydeep's intel. Indeed, I think even if Jaydeep doesn't get any intel on the paper, it'd be really good for him to speak to someone from Harvard, just to help him put things into perspective about South Asia. Because right now his views are totally out of whack with reality, and he's been a naughty boy too, saying very bad things about me in a comments section elsewhere. So yeah, hopefully he takes up Nick on his offer and gets a bit of a reality check. So you are saying indirectly , that Patterson suggested to you that S Asian aDNA has proven Steppe Hypothesis ?. Who do these authors mean by the Huns? All the reports suggest a multi ethnic confederation. The paper seems to me to an attempt to justify a foundation myth. Would not a reasonable/simple solution to " correct interpretation of our history and tradition" and other forms of manipulative/narrative types controlling of data; be solved by just releasing the raw data in public free domain, that way everybody has access to information about their potential ancient ancestors/relatives? What harm in public/humanity having open access to results of ancient specimens from every-time period and place as genetic tests are completed;completely by-passing the narrative phase peer review process ? One thing worth pointing is that the most passionate about this are we. But I agree, let’s get the data. Indian scientists need not feel it is only they who need to see to be most accurate understanding of evidence. There are plenty of people around the world capable of being impartial, esp the people probably already involved in the studies themselves. So you are saying indirectly, that Patterson suggested to you that S Asian aDNA has proven Steppe Hypothesis? So there's no reason to assume that ancient DNA from South Asia won't back up these results. And at the very least the possibility that there were large scale population movements from the steppes to South Asia has to be treated very seriously. Jaydeep, and you as well, refuse to acknowledge this. And obviously nothing that I can say or do here on this blog is likely to convince you guys otherwise, so Jaydeep needs to hear this from the horse's mouth and also from someone who he might consider an authority on the subject. And then maybe, just maybe, he might shut up for a bit, wait for the paper, and stop calling me a bigot online. What harm in public/humanity having open access to results of ancient specimens from every-time period and place as genetic tests are completed;completely by-passing the narrative phase peer review process? Well, you'll be happy to know that I actually said something like this to the folks at Harvard last year. Maybe they're chewing it over, I don't know? If they were "conquerors", their mtDNA lineages would have died out as it's quite suspect that hordes of women would have been among them. Thus, minimal to no mitochondrial contribution is to be expected. But there are genuine concerns whether the genetic data available to us will not be put to good use because of political reasons. Nonsense , politics has no influence in these studies . Ah! well sorry as I said , my English is weak , I must have misunderstood !. aDNA from S Asia will show ''Steppe Type Ancestry'' , but there is again the question of its time depth! as I am saying for years now . So nothing new really, I thought you found out something ..
"Well, you'll be happy to know that I actually said something like this to the folks at Harvard last year. Maybe they're chewing it over, I don't know?" One experience/personal nature with a co-worker of Indian heritage. We were discussing and comparing caste among Hindu and heritage among Sikh. The topic of genetic testing [price and benefits]came up and what it is able to show the relationship with fellow human beings regardless of nomenclature and phenotype. I pointed out that the results are sometimes surprising! There may have been a mix up in genealogy family tree. Perhaps an adoption and or other circumstance that will be made transparent with genetic results. I think transparency is a good thing overall. @Chetan Why did proto-Hungarians leave such a low Y-DNA influence on Hungarian populations while affecting a language shift? To sum up, ancient Hungarian yDNA is not only N, but it includes R1a1, R1b and J as well. @Nirjhar You think politics doesn't influence academic research? Especially the humanities related research is heavily influenced by the prevailing political climate. That doesn't mean of course that all research is suspect, but to deny it would be dishonest. Though human genetics is very empirical-based and less likely to be manipulated for political ends. no no Chetan , I have been in many important institutes and have discussed with various academic scholars . You can stay assured ,that politics fortunately is not a concern . Lets just wait . We are going have a great knowledge . If I decode his nomenclature correctly, he argues aganist the widely accepted assignment of Hungarian language to Magyars. I agree with that, as there is no evidence of the language Magyars spoke, and that assignment is a pure speculation. 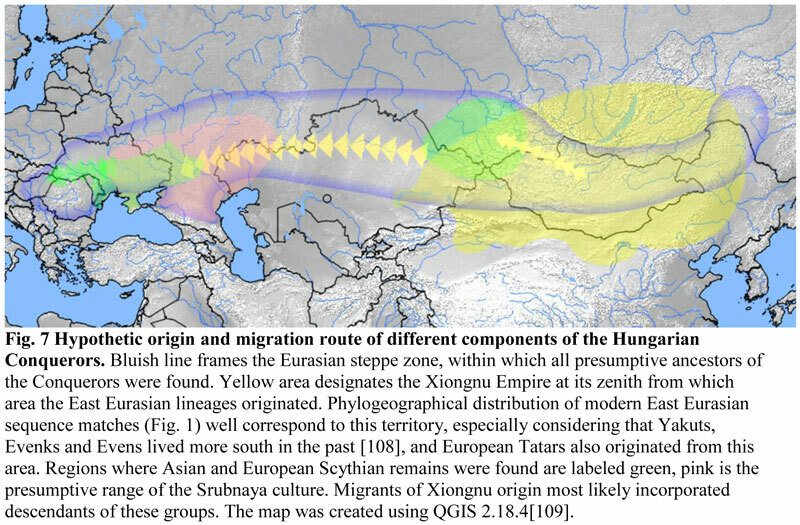 Another speculation is IMHO more likely, that Hungarian got there as part of the initial Hun conquest, when the Hun were still very heterogenous and spoke variety languages of the tribes they accumulated on the route from north China. By 9th century the steppe tribes more or less settled on speaking Turkic and so did likely Magyars. @a Well upper castes are not really that related to lower castes. Of course, there is some shared ancestry, obviously, but genetically, there's not much relation. And yeah, even upper castes have Dravidian/ASI/Onge ancestry. @a On a side note, most of the shared ancestry between upper and lower castes is ancient. Do they seriously imply the presence of a Ugric language in the Carpathian Basin since at least the Middle Neolithic? The authors should make a clarification/correction in that part, otherwise it will stay as apparently the most nonsensical statement in the whole paper. "”The Hungarian population began to decrease at the time of the Ottoman conquest, reaching as low as around 39% by the end of the 18th century. The decline of the Hungarians was due to the constant wars, Ottoman raids, famines, and plagues during the 150 years of Ottoman rule. 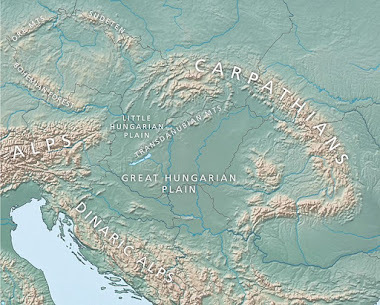 The main zones of war were the territories inhabited by the Hungarians, so the death toll depleted them at a much higher rate than among other nationalities. In the 18th century, their proportion declined further because of the influx of new settlers from Europe, especially Slovaks, Serbs and Germans. As a consequence of Turkish occupation and Habsburg colonization policies, the country underwent a great change in ethnic composition as its population more than tripled to 8 million between 1720 and 1787, while only 39% of its people were Hungarians, who lived primarily in the centre of the country.”"
In general, it is still very difficult to confirm these admixture directionalities, however, due to the highly "loopy", bidirectional, and "back-migrationary" relations between various Hungarian and Turkic tribes historically... Who knows what amounts of huge loops carried that H-T152C! from here to there, back in between somewhere, another there, ... and here again, perhaps picking up all other kinds other kinds of things in between? and I could only find that his closest 23andme match is descended from the village "Turkeve" in Hungary. Do you mean your father by "his"? Autosomal matches like 23andMe, Family Finder and Ancestry matches go back about 500 years at most. So your father's 23andMe match with that Hungarian should be from the Ottoman times. Hungarians from Romania have inbred mtDNA like lots of ethnic minorities. Also, 5% have Asian mtDNA while normal Hungarians have 1% Asian mtDNA. Didn't the Hungarian conquerors come much after the Huns that raided the Roman Empire? I am confused which group is being referred to in this paper? I wonder why we discuss Hindu Nationalism and not Hungarian Nationalism aka Jobikism here, as the bespoken article fits well in Jobbik ideologies. "We have determined the distribution of Y chromosomal haplotypes and haplogroups in population samples from one of the most important areas in north-eastern Hungary from many villages in the Bodrogköz. The Bodrogköz region was chosen due to its isolated nature, because this area was a moorland encircled by the Tisza, Bodrog, and Latorca Rivers and inhabitants of this part of Hungary escaped from both Tatar and Ottoman invasions, which decimated the post-Hungarian Conquest populations in many parts of the country. Furthermore, in the first half of the tenth century, this region served as the Palatial Centre and burial grounds of the Hungarian tribes. It has thus been assumed that the present population in this area is likely to be more similar to the population that lived in the Conquest period." Their conclusion is that "We identified nine samples (6.2%) as likely Finno-Ugric lineages, with genetic matches closer to those of Uralic ethnic groups, such as Mansi and/or Estonian, than to non-Uralic groups (5 R1a-Z280, 2 R1a-M458, 1 N1c-Z1936, and 1 N1c-L1034). While haplogroup R1a-M458 has been considered “West Slavic”, our analysis showed that over half of the 30 M458 samples were not of recent Slavic admixture." "In our recent study, one N1c-L1034 sample was found in Bodrogköz, which has proven to be a paternal link among Hungarians and Western Siberian Mansi (Fehér et al. 2015), and N1c-Z1936 (xL1034) was found to likely be early Ugric. ... In addition, based on Y-STR analysis, one R1b-M343* sample was recent Turkic admixture from the R1b-M73 Kypchak (DYS390 = 19) cluster; ... though it could be of Avar, Onugor, Hungarian, or Cumanian origin. Based on the Bodrogköz population, the arriving Finno-Ugric-speaking paternal lineages likely made up no more than 10% of the population of Hungary in the tenth century AD ... . The share of Finno-Ugric-looking paternal lineages shrank to 6.2% due to continuous influx and assimilation of neighbouring peoples in the following centuries." "Europeans had practically zero influence, both genetic and cultural, on pre-Ptolemaic Egypt. At least the Steppe populations did not. Ancient Egyptians were basically Natufians with some ANF and CHG/Iran Neolitic admixture. They were not at all Europeans, not in the least bit"
I think many of those dynasties may have started with mercenary revolts: sea peoples, nubians, hyksos etc. "Why did proto-Hungarians leave such a low Y-DNA influence on Hungarian populations while affecting a language shift?" Conquest by a specifically warrior elite might lead to a balance between a higher casualty rate and a higher reproductive rate (especially illegitimate but provided for children). So I'm thinking if there were two elite conquests in quick succession then the first one might not have had the time for the reproductive advantage to outweigh the casualty rate? The other idea i had (different version of same thing) was an elite conquest by two allied groups, same language but different in genetics who later fell out with the second group winning. Was there some kind of civil war among the Hun elite soon after they took Hungary? @Kristina Hunnic Empire of Attila was a conglomerate of all kinds of tribes that were picked up by the Huns in their westward swoop across the Eurasian steppes. Hunnic itself was spoken only by the chieftains and the local tribes retained their own languages. I can definitely imagine proto-Hungarian speakers near the Urals who get incorporated into the Hunnic Empire but still retain their language. They would have later moved on into Hungary in the 9th century imposing their language there. This proto-Hungarian group like you said could well have been R1a-N1c 3:2. R1 from the earlier Corded Ware culture and N1 from the later Uralic expansion. I find it really odd though that one-third of the Hungarian Conquerors mtDNA is derived from East Asia but none of the usual Y-DNA associated with Turks show up (like Q or C). Really odd considering the patriarchal nature of Turkic conquests into the east. "Was there some kind of civil war among the Hun elite soon after they took Hungary?" @Grey I believe the Huns themselves (the original Hunnic empire) didn't impact the Hungarian plain much as far as genetics is considered. It is the later Hunnified Uralics who migrated into Hungary in the late 9th century (by Wikipedia) and like Kristina wrote, they could already have been R1a dominant from living for centuries in the area of the erstwhile Corded Ware Culture. Don't forget the potential post-Hun Avar and Bulgar layers. "Don't forget the potential post-Hun Avar and Bulgar layers." The Hungarian language does contain a great deal of words that are exotic in a European context, yet not of Finno-Ugric etymology. Many of these words are very basic, with meanings like "summer" (Hungarian nyár, cf. Turkish yaz), "to lick" (Hungarian nyal-, cf. Turkish yala-), "sea" (Hungarian tenger, cf. Turkish deniz; this is actually the same word as "Genghis" in "Genghis Khan"), and so forth. There are even examples like Hungarian gyöngy "pearl; bead" and Turkish inci "pearl," both ultimately from Chinese zhēnzhū (珍珠 "rare pearl/bead" or 真珠 "true pearl/bead," whence also Japanese 真珠 shinju "pearl" and Korean 진주 jinju "pearl"). 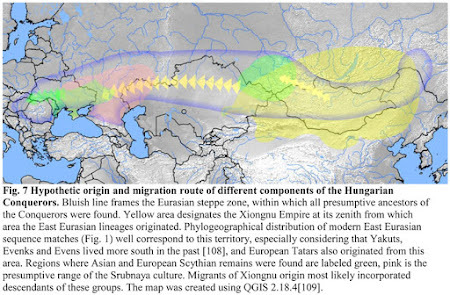 However, it is not clear whether (or how much of) this Turkic influence in Hungarian has been picked up prior to (or during) the migration of Hungarian-speaking ancestors from a previous homeland to the Pannonian plain, or whether (or how much of) it has been picked up locally from hypothetical unattested descendants of Huns, Avars, Bulgars, etc. The languages of those invaders are surprisingly obscure when considered against the lasting renown of the ethnonyms themselves. Actually, I should mention that the ultimate origin of the word for "lick" is not really clear. Similar words are also used in both Finnish and Mongolian. I suppose it would be prudent to say that the root appears to have been shared in some manner at some point in time with Turkic and Mongolic rather than to say that it is not of Finno-Ugric etymology, because it is very widespread among the Uralic languages, too. I'm somewhat surprised that the authors do not underline the fact that according to Ilumäe et al Hungarian related paternal N-Z1936's are also to be found among Volgaic Tatars and Bashkirs. Volgaic Turkic Chuvash, if I'm right, is on the other hand the only surviving Oghur Turkic language, c.f. Onogur > Hun(V)gar- and the apparent Oghur Turkic based loanwords in Hungarian. "Do you mean your father by "his"? Autosomal matches like 23andMe, Family Finder and Ancestry matches go back about 500 years at most. So your father's 23andMe match with that Hungarian should be from the Ottoman times." The 23andme match is of course within the Ottoman timeframe but not necessarily the mtDNA hg match (which is not an autosomal match). Also, my dad is sharing > 7cm with other Hungarians and Bulgarians in David's IBD analysis (e.g. his 2nd and 3rd top matches from the public samples used in addition to others later down). That's why I mention the complexity of the various possible paths of relatedness. "I find it really odd though that one-third of the Hungarian Conquerors mtDNA is derived from East Asia but none of the usual Y-DNA associated with Turks show up (like Q or C). Really odd considering the patriarchal nature of Turkic conquests into the east." My mtDNA was found in the Globular Amphora culture! U5b2a2b1. I think it's pretty cool. It's not from a new study. I don't why I didn't notice it before. Their linguistic conclusions are BS. Nothing from the data supports it. This just looks like the Hungarian equivalent of Hindu nationalists trying to shore up OIT. We would expect the Magyars to have Turkic mtDNA from political marriages if the Magyars had close political connections with Turkic peoples - which we know they did. And of course, genetic input is not required for language change. Hungarian folk memory about descent from the Huns is about as trustworthy as Romans claiming to be descended from Trojans. Typical, that I am too preoccupied to check on this blog when such an article is coming up and being discussed. I am late to the discussion, but I write here some thoughts anyway. This article, more precisely some earlier Hungarian articles by the team, caused some heavy debate here in Hungary (among the small minority of people who cares about population genetics). The team that conducted this research pretty much set out with goal of proving the Hun connection and this caused some severe confirmation bias (although this English article seems to be more measured that some earlier Hungarian work by the team). An archaeologist on a Hungarian site even hinted that the authors refused to work with the Hungarian laboratory that have the most close to the state-of-the-art tech, because the staff of that institute do not share their biases. So there is some tension. 1. The conquerors being at least partially Turkic is not news, it was the historical and linguistic canon for a long time, down to the schoolbooks of my childhood. The conquerors are traditionally described as an alliance of Uralic and Turkic tribes and Turkic influence is apparent even on the tribes that thought to be Uralic. Some proposes a likely bilingual society for a few generation (not a fringe theory, I have even read an article on the home page of the major Finno-Ugric university department that states this as a fact). It is also widely accepted that much of the Turkic influence on the Hungarian language comes from Oghur Turkic. 2. Although there are some other sites, the wast majority of good quality data in this study are from one place, the Karos I-II-II cemeteries. Those are few hundred meters from each other in the North-Eastern Carpathian Basin and they were used paralel by three allied clans in the first half of the 10th century. Because these samples dominate the data-set, the results of statistical analysis mainly come from this particular site-complex. That is, possibly just from a segment of a heterogeneous tribal alliance. Now, the results. They found out that there is an East Asian part of the mtDNA that comes where Turkic people came and a West Eurasian part that is consistent with assimilated steppe Iranic groups as a possible source. Those are known for being assimilated by Turkic all over the map. No surprise here, this is consistent with the canon. Of course there is a spin on this in the conclusion. They wanted Huns, so the classify all Oghur Turks as Huns. They state in the article that Avars, Onugors, Bulgars, etc. were all just different faces of Huns. Well, if you accept this classification, then sure, the conquerors were part Huns. Nice. The authors implication that the Uralic root of modern Hungarian could come from a local presence that is here since the Neolithic is fantastically wild. "Hungarians from Romania have inbred mtDNA like lots of ethnic minorities. Also, 5% have Asian mtDNA while normal Hungarians have 1% Asian mtDNA." They are ethnic minorities only in the last 100 years, except the Easternmost group that live in Moldavia. And that inbred thing has more to do with small population size combined with isolation, not the technicality of being a minority. Some of the Hungarians from Romania (the Székely and the Csángó) have a somewhat separated ethnic identity (from mainstream Hungarian) and that can be traced to history. So it is possible (in fact among Hungarian widely accepted) that they had different ethnic background within the "confederation" to begin with. Also they were more isolated from Slavic and Germanic inflow after various wars that devastated the Basin region (mainly the Ottoman wars that caused an 50 to 90% population loss in various regions of the basin, followed by a huge inflow of settlers). As always, very well said. This study somewhat calls to mind the Zsolt András Bíró studies, which were very biased in their Hunnism/Turanism.